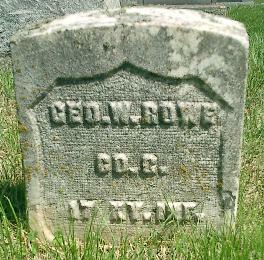 George W. Rowe was enrolled in the 17th Infantry on November 2, 1861. He was mustered in on January 4, 1862 at Calhoun for a three year term. He was 1st Corporal of Company G until March 25th '62. then 1st Sergeant until consolidation; transferred to Co B as Corporal; discharged May 2nd '64 for disability.